Many American children are getting too much sugar in their diets. Recent recommendations from the American Heart Association (AHA), state children’s added sugar intake should be 6 teaspoons per day MAX. Children under 2 years are to skip it all together. Limit candy to one serving when allowing it. Follow the recommended serving size on the package (usually 2 or 3 per serving) for treats like cookies. Purchase canned fruit that is “canned in its own juices,” rather than in syrup or heavy syrup. Use water and milk (or a non-dairy fortified substitute) as the primary beverages, most of the time. Limit soda and other sugary beverages to special occasions. Watch the amount of juice, even if it’s 100% juice. Children under 6 years should consume no more than 4-6 ounces and those kids over 6 years no more than 8-12 ounces per day. Be careful of sugary cereals, and try to choose a cereal with less than 9 grams of sugar per serving. Alert! Granola bars can be a sugar trap. Look for bars with less than 10 grams of sugar per serving. Cut the amount of sugar you add to homemade recipes. It’s easy to cut out ¼ cup of sugar without any major impact on taste. Don’t spoil the health benefits of yogurt. The most sugary types of yogurt are the ones with candy or chocolate you can add to the yogurt (nestled on top or alongside), and the versions with fruit on the bottom carry a sugar punch, too. Plain and flavored yogurts contain the lowest amounts of sugar. Make sure after-school snacks are nutritious and preferably showcasing a source of protein, healthy fat, and/or fiber. Make your own popsicles. Puree frozen or fresh fruit in a blender with water or milk and freeze into popsicle molds. Offer fruit at most meals, if not all of them. Fruit offers that sweet flavor kids may crave without all the refined sugar. Frozen fruit makes a refreshing treat. Try freezing grapes, mango, and banana for starters. Cut down on pre-made meals or at least check out the sugar content. You may be surprised! Get a handle on sports drinks. Young athletes can over-consume them, adding extra sugar to their diet. Most young athletes do just fine with water. (Exception: exercising in a hot, humid climate or for over an hour). Don’t use sweets as a reward for eating healthy foods, or for trying a new food. Sprinkle sugar sparingly when adding it to fruit, cereal, or toast. Honey, agave, sugar, syrup, chocolate sauce and more are fancy words for added sugar! 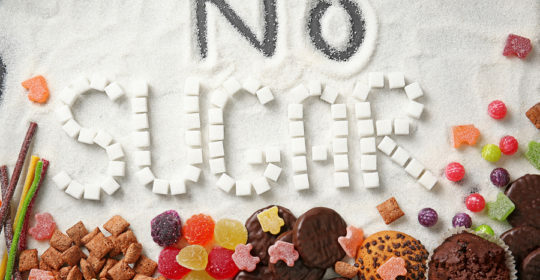 Wean off sugar by diluting the sugary foods your child likes with its non-sugary counterpart. For instance: Mix sugary cereal with a low sugar cereal or mix plain and fruited yogurt together. Surprise, surprise! Sugar is often found in mayonnaise, bread, baby food, crackers, tortillas, sausages, salad dressings, packaged oatmeal, and more. Keep your eyes open and read the labels. Need help learning how to read these confusing labels? Email me for a private consultation at nutrition@potomacpediatrics.com. Limit sweets to one or two per day on average and keep the portions petite when you can. More surprises: canned soup, salad dressings, and tomato sauce can harbor extra sugar, even though they don’t taste sweet. Use mini-portions of sweets and treats as much as possible. If baking your own sweets, make cookies bite-size, cut brownies into “bites,” and use the mentality of quality over quantity. Want the PDF Version to keep handy?